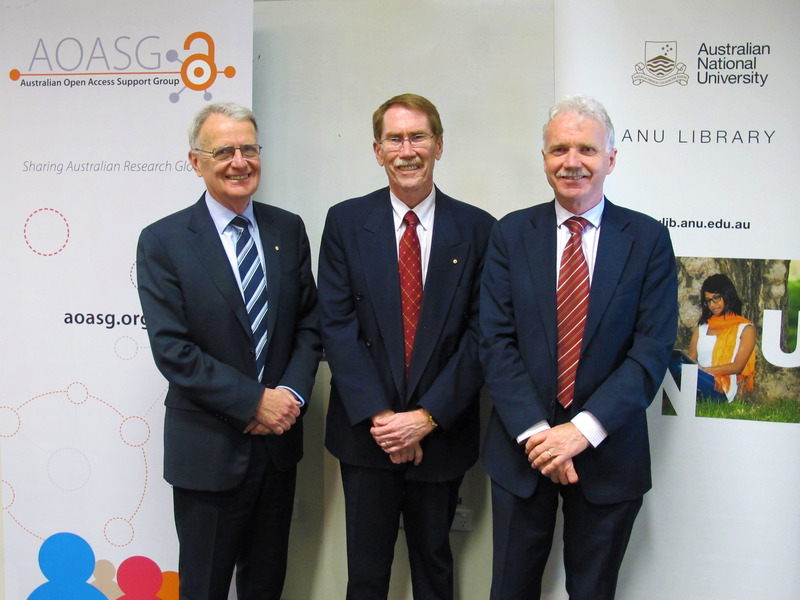 In celebration of Open Access Week, the Australian Open Access Support Group (AOASG) and the Australian National University (ANU) invited the Chief Executive Officers of the two government funding agencies to a panel discussion about their open access policies. Professor Aidan Byrne, CEO of the Australian Research Council (ARC), and Professor Warwick Anderson, CEO of the National Health & Medical Research Council (NHMRC) spoke about their open access policies, and then participated in a Q&A session that was moderated by ANU Vice Chancellor, Professor Ian Young. The session was recorded and is available on the ANU You Tube Channel (see below for time stamps of different parts of the recording). The slides and an audio recording are also available (note the recording goes for the whole event but there were only slides from Professor Anderson’s presentation). The presentations covered the broader international open access landscape and how much this has changed in the past year. Both Professor Anderson and Professor Byrne discussed how, given the speed of change in scholarly communication, it is almost impossible to know what the open access agenda will look like in five years time. For this reason, neither the NHMRC nor the ARC wish to be prescriptive about how to implement their policies. The presentations underlined that neither policy advocates a particular method of achieving open access, or specifically requires payment for open access. However, the NHMRC considers the cost of publishing journal articles a legitimate Direct Cost of Research, and the ARC is progressively removing the caps on the percentage of research funds that can be used for publication. One of the questions that arose was the issue of monitoring compliance to the policies. Both organisations are working on the premise that as researchers make their work open access they will see the benefit of having work available. Professor Anderson noted the NHMRC’s Research Grant Management System now allows Chief Investigators to list publications linked to grants and these will be checked next year. While there are no current plans to withhold future grants from researchers that do not comply with the policies, this could become the case into the future. More than one researcher noted the challenges with making creative works, or culturally sensitive research freely available. Professor Byrne reiterated that these were examples of why the ARC was not expecting 100% compliance to their policy. 30:49 – The second person asked if there were particular things we should be doing in Australia to comply with the policies and whether we should be positioning ourselves in terms of the international context? 46:36 – The question related to data, and noted that the policies have been shaped and informed by changed expectations of an open society but how have they been shaped and formed by processes in government to make data more open for the taxpayers?